Solutions Anatomy of Hindi font design. The Devanagari script in itself is so beautiful that we often tend to overlook the scientific and technical aspects of it. Delving deep reveals so much more about the script and enhances the overall understanding of the language. One of the first things that is obvious and comes to anybody’s notice is how there is clearly a “Roof” to the entire typeface here. The roof that is actually a line from which all the consonants in the alphabet hang is a part of the entire typeface and plays a major role in even differentiating the pronunciation of many words that are formed. There are amongst all of these, prominent features in the typeface, like the “Nose”, the “Hive” etc, which are a feature of many consonants and give a prominent character to the entire alphabet. Taking reference from the basics, typefaces by convention are comprised of lines that are either, straight, curved or slanted. 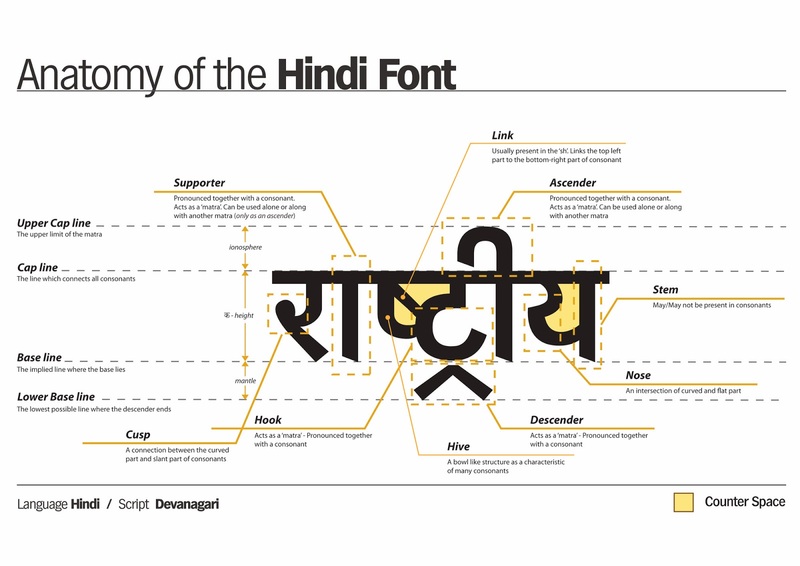 In the Devanagari script too, it is an amazing amalgamation of the three and the formations when noted carefully are beautifully set together.